Your backyard is filled with building waste from the refurbishment of your house? So why not benefit from our professional rubbish removal West London W company. Better Cleaning Company offers effective and reasonably priced home and office, after builders & garden waste disposal as well as recycling. Contact us at 020 3746 3201 or fill in online request for a free of charge viewing for an exact price estimate now! If you are having trouble cleaning out and disposing of the excess builders waste following the reconstruction of your home, we are 7/7 prepared to help you. 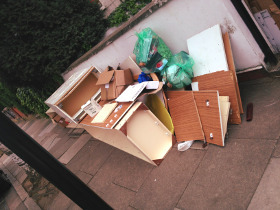 We provide top quality building waste removal West London W in accordance to all rules. Our waste disposal staff will carry out all the hefty lifting and loading, and can be quite beneficial for bulky waste clearance and all kind of remodelling debris removal. Our personnel are background checked and taught to properly handle your junk. They will show up with a lorrie for loading and transporting the builders waste to the recycling site. We will recycle as much of your waste as possible. For fast and efficient assistance in removing out excess stuff and rubbish from your house, get our professional waste disposal service right now! Rubbish Collection Company in West London - The Highest Rating On The Market! Rubbish collection service in West London is provided by Better Cleaning Company. Top-notched cleaning company with huge expertise in removal services, as well. We have been on the market for 10 years and we do know how to satisfy and please our consumers. As a matter of fact, your positive feedback is the best value we receive from our reliable rubbish removal services. Accepting this as our practice, we have succeeded to build up the fasted and the most affordable rubbish removal offers across the whole West London territory. Note that we are aware of all the dumpsters and recycle centres in Great Britain, so wherever your location is, we will move the garbage to the closest centre without disturbing you to look for such. We are set up to deliver a swift, hassle free garden waste collection West London W service 365 days per year. Our rubbish collectors will come with a lorry and all the equipment required to gather, fill up and dispose of your garden waste. This includes green waste removal, brown waste removal, branches, leaves, trees, hedge or grass clippings, and also garden waste recycling. If you decide to reserve our top quality rubbish removal services West London W, you should contact our 24/7 phone line 020 3746 3201 or fill in an online booking form for a free viewing or perhaps directly buying our service. Better Cleaning Company ensures a rapid arrival of our seasoned 2 men teams at your doorsteps. They will examine the volume of the waste, and will offer you a price estimate immediately. Collection and loading will begin immediately after that. As a licensed rubbish waste carrier we always do the recycling on your behalf.